/ Which Are The Most Stable Fishing Kayaks For River Fishing? If you are one of the die-hard fishing lovers like me, you should understand the fear of falling into the water while enjoying the trip. I have experienced it and trust me, it is not something you want to remember every time getting near the water. That time, I not only got myself completely soaked and looked like a river monster, but also chase all my prey away by the loud, sudden movements. That’s one of the reasons we should get ourselves one of the most stable fishing kayaks for river fishing. Besides, as you may know, the biggest catch will come when we keep ourselves as still as possible. If your kayak keeps moving up and down or goes round and round when it’s a bit windy, the fish will just get away from you. You may be surprised that although they are of the same price range, kayaks can be distinctly different while looking at the stability. Professionals can somehow adjust the features when something happens, but newbies to the activity can lose the balance and make an impressive dive if the vessel oscillates when they are hunting a big fish. The stability of a kayak depends on two feature: the length/width and the type of kayak that you choose. Kayaks which are shorter in length and look wider are often more stable. However, if you are looking for a rapid kayak, they are not the suitable kayak for you. So, instead of racing on the water, let’s enjoy our fishing trip slowly and catch a lot of fish on the “fat” vessels. The types of kayaks affect the balance greatly, too. In fact, sit-in kayaks often give us a more stable ride than sit-on-top kayaks do. Every coin has two faces, so if you want to win in the stability, you have to lose the advantage of flexibility. You will not be able to move around and getting out of the vessels requires more time. 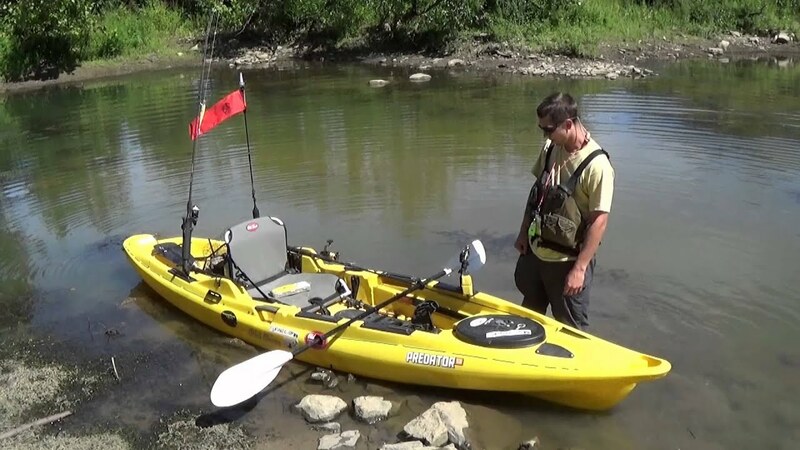 Now, after comprehending the features of a great kayak, let’s head to the review of the most stable fishing kayak for river fishing. 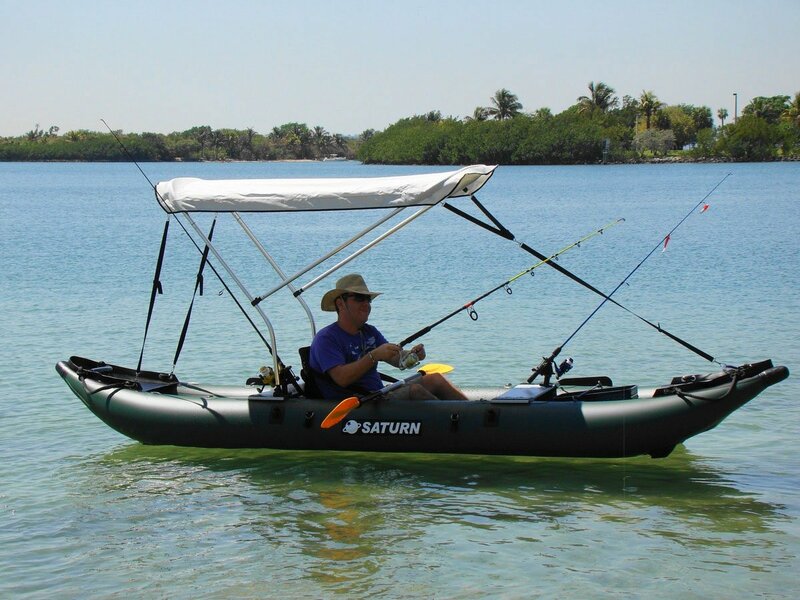 This is a great choice for you to make, no matter you are inexperienced kayak fisherman or an amateur. The vessel is integrated with an innovative twin-arched hull, which is well-known for the ability to keep the utmost stability while on water. Even the beginners will feel completely safe sitting on the kayak. As I have said above, to gain the perfect balance, you have to lose the high speed. The case of Pelican Liberty 100X is better than most of the others since the speed lost is not so remarkable. You can rest assured when seeing the name of the manufacturer Pelican. It is one of the most trustworthy kayak manufacturers in the world. The model offers you a comfortable backrest, a high storage pouch, and the mentioned impressive hull. Your fishing trip will become an enjoyable experience with the vessel. Considering the popularity of the name Old Town in the global scale, it’s a pity I cannot bring many models of the producers in the list. Old Town Vapor 10 Angler impresses buyers with the simple design and the stunning stability. The kayak is in the wide kayak group. The appearance makes it tougher under the force of wind and wave. The polyethylene hull also contributes greatly to the reliability of the vessel. I am totally into the molded carry handles, the adjustable floor braces, as well as the flush-mounted rod holders. They come to great use when you are on the way. The only minus point of the model is the modest speed. But, when fishing is our main purpose, a peaceful ride is more valuable than a quick trip. Somebody rate this kayak model as the Rolls Royce of Fishing Kayaks. I think it’s a bit exaggerating since there are a few better choices. But, overall, it is a good purchase if you love the huge space offered by the manufacturer. The Hobie Pro Angler 12 steals my heart with its Hobie Mirage Drive 180, a unique feature that other producers should consider learning from. It is a pedal based system by which you can propel the vessel backward or forwards. 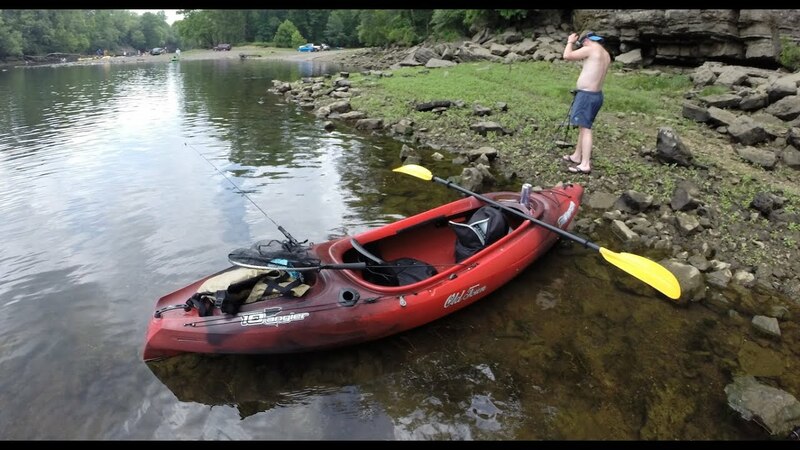 So, most of the time when you are fishing, you don’t have to bother reaching for the handles to move the kayak to get to the desired spot. If you love the traditional way more, don’t worry, you can still find the handles inside the package. Besides, the model’s adjustable skeg which is a retractable rudder, the kayak allows you to steer it in a blink without using your feet. The model is famous in the category of ocean fishing kayaks owing to its incredible stability. 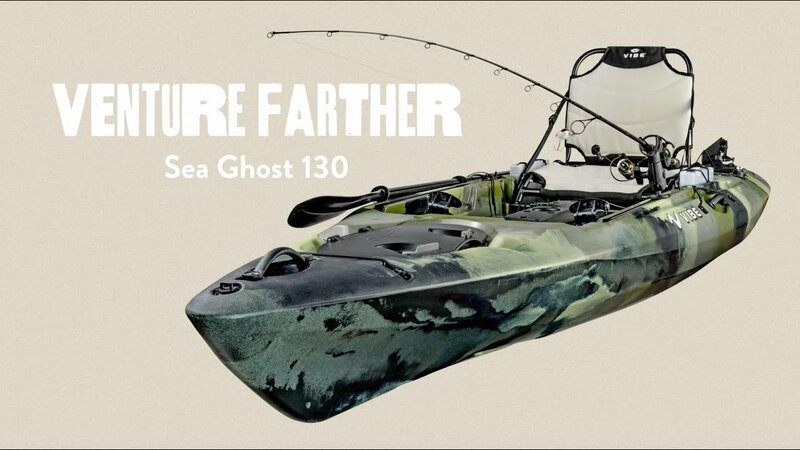 Therefore, when it comes to river fishing, Malibu Kayaks Stealth 14 will be like a fortress on the water. Its design’s also worth compliments. The 14-foot body will cut through the air and water at ease because of the pointed stern. Somebody may love the rounder stern more, but the pointed one will boost the speed more efficiently and rapidly. If you want to store a big load in the kayak, or just plan to catch a good bunch of fish, Malibu Stealth 14 is just the right fishing kayak to choose. The gator hatch is large enough to carry most everything you want, and its surface can be the seat of two people (the total weight is under 550lb). So, you can let your kid or your dog tag along and have a peaceful river fishing ride together. Furthermore, there are other places for you to jam your stuff into side hatches, middle bait tank, and bow hatch. Another product brought to you by the famous brand The Hobie. 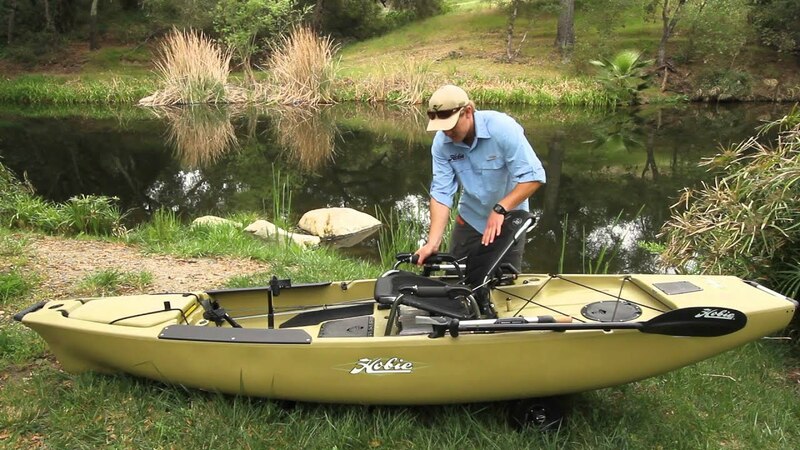 The Hobie Mirage Outback is a versatile kayak. It can serve perfectly in a fishing trip and does just as well on a leisure ride on the water. The stability provided by this model is great enough compared to most of the others in the market. However, don’t expect it to work superbly on challenging flows. The design of Hobie Mirage Outback is what I love. It is compact and smart, with an impressive color scheme. The inside is spacy enough to contain what you gain from a fishing ride on the river, as well as your essential stuff. It’s not large enough for two people to move around, but I’ve seen a guy bring his dog along and they are totally comfortable. It’s not that all the good products have to come from famous brand names. Vibe is not so well-known, and I think it’s a pity that the manufacturer is underrated. Many customers said that The The Vibe Sea Ghost 130 is the best in the sea of kayak market. The kayak has most everything we need, and it does all the tasks smoothly. When the rudder is not working, it can work totally well. But when it is turned on, it feels like the vessel is on the train tracks. Not all the manufacturers can give us this satisfactory experience. The price is another thumbs-up for the model. With such a modest cost, people may expect a low-quality kayak without a rudder or something else. Well, maybe it’s the perk of buying stuff from an underrated brand. You can never stop being happy when comparing the quality with the amount of money you have paid. However, some customers did complain about the Rotomolded Single Piece Polyethylene. According to them, it is relatively easy to scratch in fast-moving water. So I think you should use the vessel in calm water only, such as a secluded beach or river. As the name: (Old Town Predator 13) may tell, it’s a good companion when you want to gain a big catch. It is rated as one of the most stable in every list you can find. The deck is slip resistant so you can feel safe and secured most of the time. There are eight scupper holes in the hull to drain the water away and maintain the perfect balance of your vessel. However, the price is the biggest minus point of the model. 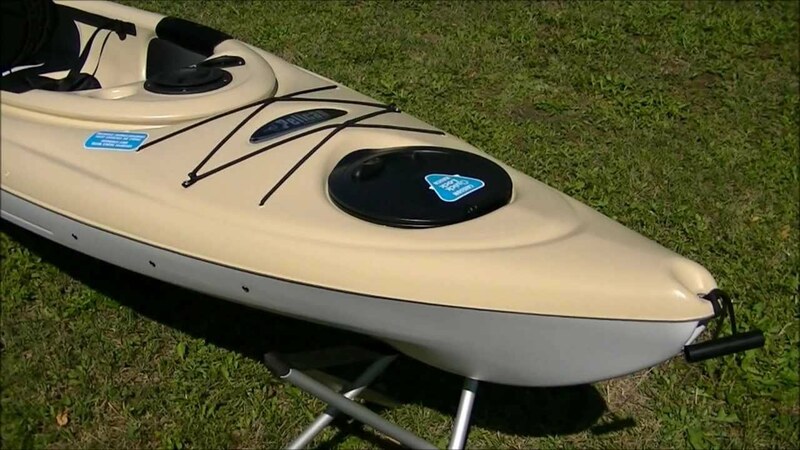 It is one of the most expensive fishing kayaks out there. If you are willing to pay a great deal for the utmost quality, it is your ideal choice. Of all the most stable fishing kayaks for river fishing I have named above, I hope you have found the best one to be your companion in the next trip. Remember, check the length, width, and type of the kayak you like before making the purchase. The brand name is important, since the reputation does matter, but it is not always the case. Sometimes, perhaps giving a new name a try is the best choice. Rosalie R. Collins – a kayaker born in a suburb of Chicago, Arlington Heights, has spent most of my youth time to conquer the strange destinations, Clifden, Florida, Alaska, etc. I never think that I will stop my journeys. Rosalie runs the blog – https://www.dailykayaking.com.